In 2014, Casey’s and Special Olympics Iowa launched a partnership through the Casey’s Cup Campaign which is held annually from Memorial Day through Labor Day. Through this statewide campaign, a photo of Special Olympics athletes and Law Enforcement Torch Run® officers is featured on 44 oz. drink cups and a percentage of each cup sale during the campaign is donated to Special Olympics Iowa. The company’s values are rooted in a sense of belonging to the communities in which it operates, which aligns with Special Olympics Iowa’s vision of inclusion for all athletes. Together throughout Iowa, the Casey’s Cup Campaign raises awareness about different abilities and helps foster growth for our programs. 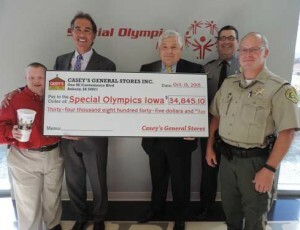 Casey’s General Store also supports Special Olympics Iowa athletes by providing financial support through Law Enforcement Torch Run® signature fundraisers including the annual Truck Convoy, a golf tournament and much more. As a Premier Statewide Partner, Casey’s General Store has provided approximately $87,000 over the years to directly benefit Special Olympics Iowa athletes across Iowa.